Hello, I have been printing some small objects recently and I have encountered some stringing and bad prints. I'm thinking it has to do something to do with my Cura settings. I have added my settings and pictures of the prints below. 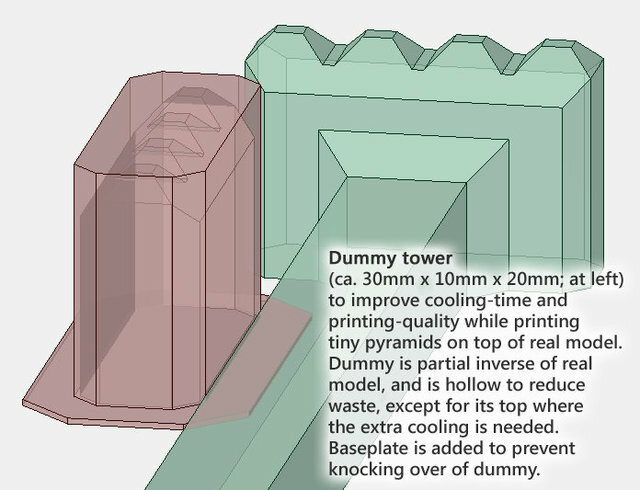 Is there an optimal setting for small prints? Also, any general tips to improve my print settings would also be appreciated. Thank you! I would say that I would go back to the default and just dial back the temp a bit more than you have. Also, that is some really teeny weeny parts to be printing. The only time I have gotten anything decent at that scale is to actually tell my nozzle to go to a very thin line width with wall counts/thickenss being a direct multiple of the nozzle width. I am assuming you are using PVA as well to support these prints? Edit: I would also look at @Gigi's recent threads on tiny prints. @Gigi is rockin' it on the teeny stuff. I also believe he is using a 0,.25mm nozzle which really makes a difference. What printer is this ? (Not an Ultimaker i guess). That made it clear. I did not have a good working definition of travel speed in me wee head. Thanks!! If I had to print this on my UM2 in PLA, I would try 20...25mm/s, and 180...185°C first. And then watch what happens and adjust on the fly as required. The slow speed is to get as little nozzle pressure as possible, thus even flow and less leaks during travel, and the low temp to improve cooling and reduce stringing as much as possible. 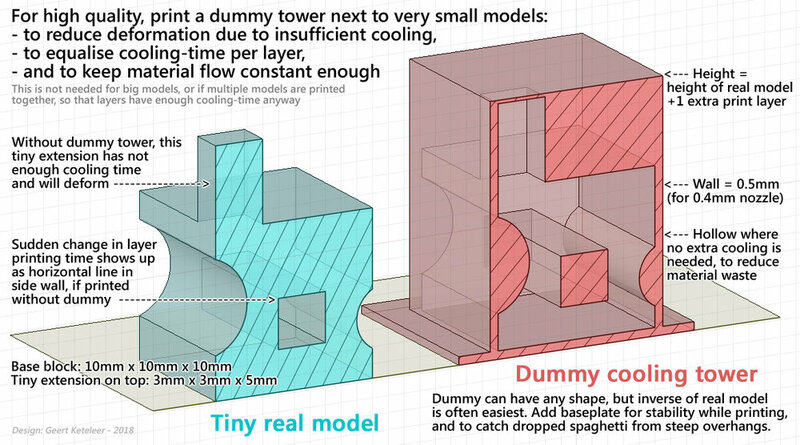 And of course I would print a dummy model next to it, so the nozzle has more cooling time, to avoid heat-deformation. 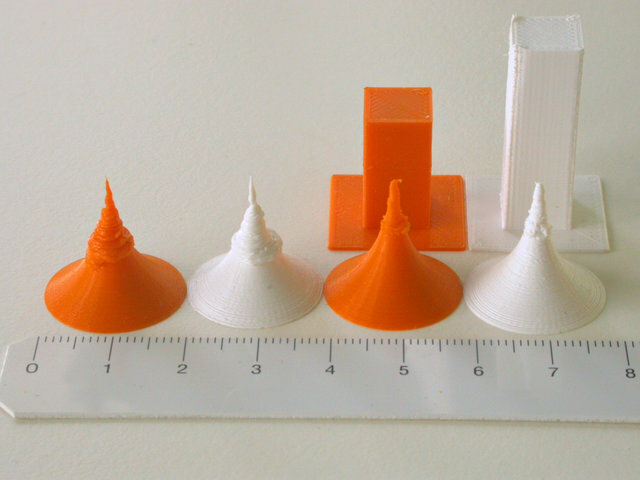 Less heat deformation with a dummy (square tower) next to the real testmodels (cones). Numbers are cm, little lines are mm. The cones are 20mm diameter x 20mm high; the blocks are 10mm x 10mm wide, and higher than the cones. Example of real dummy and part of real model. Another dummy in a real print. In your settings it says that the material diameter is 1.75mm ... is it a modified Ultimaker? Thank you I'm printing this on my monoprice select mini. I will definitely be trying this method thank you! Thanks I'll try that. I know there small but I want to be printing some jewelry peices so these prints were some test prints. I'll check out the thread you mentioned. Thank you!